Aerial Austin Skyline - Aerial Austin skyline with the latest view along Lady Bird Lake with the hike and bike trail along the waters edge. 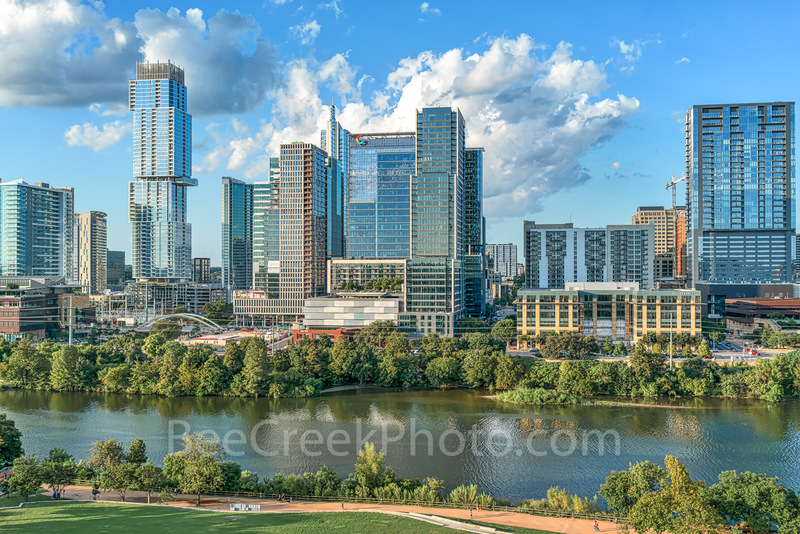 This austin skyline includes the new tallest building in the cityscape the Independent or Jingle as some call it, along with the Google new home, the Northshore condos, and of course the W building, and so many others its hard to name them all. You can just barely see the Austin 360 anymore as the new high rises have almost completely block its view from here. Austin Texas is a fast growing city with all of it sky-scrapers built in the last ten year so it is has a modern cityscape in downtown. The city has also attracted many high tech companies to the city not to mention it is also the state capital and it is home to a major school the University of Texas. The city contines to draw tourist and people wanting to vist or live this lively modern city and its well know night life being the music capital of the world and it great life style. This is just another one of Texas skyline images from a modern city. However with that said I must mention the draw back from the increase traffic which can be a complete night mare at time. Photo © copyright by Bee Creek Photography - Tod Grubbs / Cynthia Hestand.